In my 52 year history, I only have a few true regrets. Things I would choose to rewind and do over. Things that in the big picture may have seemed really small, but over the years have continued to cloud into my thoughts. Things that I can not forget. Like most parents, I have some guilt and regrets over things I wish I had done differently or had done or not done, but overall I am content with the way my husband and I raised our three sons. They have grown into human beings that are caring, responsible, educated and living their truths (to use a popular phrase). I have not committed any criminal acts, or violence against an animal (except maybe a Guinea pig, but it wasn’t on purpose) or a human. For the most part, I think that I show kindness and understanding. I can typically put myself in another person’s shoes and understand their feelings and actions. (Not necessarily a skill I use with my husband, but that is another post!) I am sure there are many times I have said things that in the few moments following those words, I would take it back or change it, but not true regrets….things you would push the rewind button on. Until I was eight or nine, my family lived in the house that had belonged to my father’s parents in the small town of Grand Cane in Northwest Louisiana. I did not know either of his parents, in fact, the only grandparent I knew was my mother’s father, John Olin Thornton. I grew up with two sisters; I am the baby. My sisters are five and six years older than me. 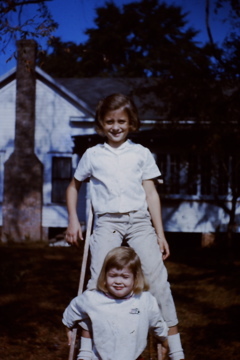 I remember playing with my middle sister, Ann, because we had some friends that were sisters and we often all played together. I remember doing some things with my oldest sister, Pam, in fact, she was a great older sister who did not mind me hanging out with her and her friends at times, but we didn’t really play together. The house sat on a large corner lot near the edge of town. There was a large barn that was filled with glass front cabinets from an old store, stacks of army trunks, boxes of furniture that my husband and I raided after we got married, and floor to ceiling shelves lined with old cigar boxes full of screws, nails, and bolts. There was another shed where lawn mowers were kept and maybe my dad parked his truck. This was where we kept our bicycles. It was also where my sister Ann would ride her bike into the back wall because she didn’t know how to use the brakes on her bike. This barn was made from corrugated metal roof material. We always knew when Ann got home. There was another short shed attached to the large barn where baby calves were kept and probably chickens from time to time. We could climb up on the roof of this shed and lay down and never be seen by other people in the yard. I remember laying on top of that roof one day with my friend, John, the son of my emergency mom (see previous post of same name) listening to his new transistor radio. I am sure it was a hot, summer day and we were bored. There was also a horse barn where our two horses were fed. It opened out into a pasture where they grazed. My father’s small animal veterinary clinic was on the adjacent lot to the house. My dad being a vet meant that we had some strange animals as pets from time to time. I remember a turtle. And there was a skunk that had been de-scented. It also meant we had lots of cats. If someone brought a cat into his office to be put to sleep, if it wasn’t truly sick, he would just bring it home to us. Because of this we ended up with Violet, a long hair Persian of some kind, that was nice as long as you didn’t touch her tail. We also had Timothy, a blue point Siamese, that was over weight and extremely timid… except for the time he jumped out of the second floor window of our new house when someone was putting some cat food out in the yard down below. That showed real bravery. And in the summers, there was usually a large animal watering trough that was pulled into the yard for us to fill with water and swim in. After only a few days, the bottom of the trough would begin to grow algae and get very slippery. And then it would sit empty of children but full of lots of floating, growing “things”. One day my friend, Nanette, came over to play. We were in the playhouse and we were talking about our dolls. I don’t remember whether Nanette was saying that her dolls came to life during the night and I was arguing with her about how that was not true even if her mother said it was, or if I was telling her that my doll came to life during the night and that my mother said that it could happen. I really can not recall which side my argument landed on, but I was very upset that Nanette did not believe me. Nanette wanted to leave and go home. I remember thinking that if I could just keep her here in this playhouse with me, that I would be able to convince her of the ludicrousness of her argument and then she would not be upset with me and she would not want to go home. I body-blocked the doorway and tried to keep her from leaving. I am pretty sure she started crying. If I had been in her situation, I am sure I would have cried. To have your friend turn into a bully right in front of your eyes is a scary thing. At some point, I relented and she ran home. I taught 1st, 2nd, and 3rd grade in a Montessori school for many years, and at least once a year I told my students the story about the day I blocked my friend from leaving my playhouse. I would hear a student say or do something that would hurt another person’s feelings, it might even involve someone that was a good friend. I would tell them that most likely Nanette doesn’t even remember that day. But even after 40 something years, I remember it as though it happened yesterday. My face still burns with embarrassment when I think about it. I told my students that the person we hurt most is ourselves. Maybe we all have these moments to relive in order to remind us to be kind. 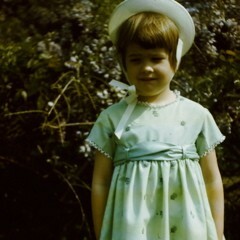 That day in the playhouse in my yard in Grand Cane, Louisiana, is a day I would rewind and do over if given a chance. Maybe if Nanette reads this, she will forgive me and I can.